B&B Lost in Rome v Řím, Itálie: Zarezervujte nyní! 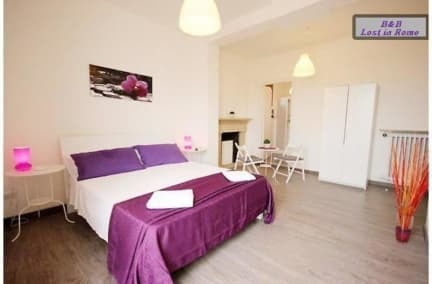 Five-minutes walk by Coloseum, Roman Forum, Circus Maximus, Piazza di Spagna and Fontana di Trevi, the house interiors have been restored with modern, warm and elegant furniture. Our suggest is loose yourself to discover an unusual reality which gives to the City the title of Caput Mundi. The rooms, modern and elegant, are equipped with a twin bed (additional bed on request), private bathroom with shower, air conditioning, free Wi-fi.